Chinese enterprises are looking toward increasing investment in Chile thanks to factors like a low barrier of entry and the South American country's stable legal system, sources told the Global Times Monday. Although many challenges remain, experts said that domestic firms should pursue localization and innovation to compete in the Chilean market. "Chile has one of the freest markets in the world with a low barrier of entry. The country has signed free trade agreements with 61 countries and regions so far, contributing to its dynamic and high-quality economic structure," Jiang Wei, deputy manager of State-owned China Harbour Engineering Co's (CHEC) Americas Division, told the Global Times on Monday. The legal system in Chile is also stable and sound, which provides companies with a transparent and favorable business environment, noted Jiang. In recent years, domestic companies have been constantly expanding in the Chilean market by increasing capital and broadening investment. 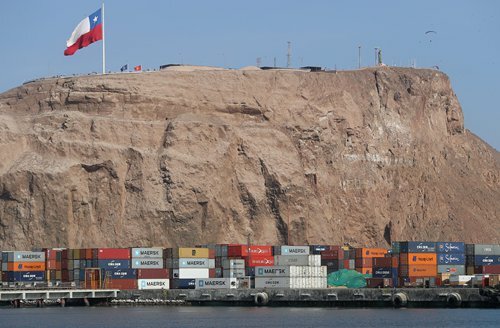 As of July, China is Chile's largest export destination and largest import source, with bilateral goods traded in the first seven months amounting to $16.48 billion, according to the data released by the Ministry of Commerce (MOFCOM). "Chinese capital in Chile primarily goes into sectors such as mineral product exploration and development, wine production and fruit plantations as well as infrastructure construction like the building of power stations," Liu Jianying, an associate research fellow of the Chinese Academy of International Trade and Economic Cooperation (CAITEC) of the MOFCOM, told the Global Times Monday. She added that the accumulated construction contracts signed by Chinese firms during the same period were worth $1.38 billion. In 2010, China National Electric Engineering Co (CNEEC) entered the Chilean market and successfully won two hydroelectric construction projects in October 2011, Li Zongzhe, general manager of CNEEC's Chilean branch, told the Global Times. Overcoming difficulties such as differences in language and culture, the company completed the two projects in 2013 and 2015, Li said. "Via these two projects, the Chilean energy industry was introduced to Chinese technology and equipment manufacturing. Chile's government is now increasing the development of clean energy and our company will continue to further explore the Chilean energy market," noted Li. Other Chinese companies also have confidence in their growth in the Chilean market in the future. China National Heavy Duty Truck Group Co (Sinotruk) has been able to expand its sale channels [in the country] as more Chinese companies have invested in Chile in recent years, Tai Jianwei, the director of Sinotruk's Chilean office, told the Global Times. Sinotruk entered the Chilean market in 2008 and primarily engages in sales of commercial vehicles, Tai said. "Although we are still some way behind US and European car brands, our firm's vehicle sales will make a big breakthrough in the coming years as we put new products in the market," Tai said, noting that a growing number of customers [in Chile] choose Chinese products because they are cost-effective. It is difficult for domestic commercial vehicle companies to borrow money from banks for their business in Chile, noted Tai. "Also, local customers still hold a wait-and-see attitude toward Chinese cars… Domestic vehicle enterprises are expected to step up efforts to figure out their own problems and find ways for improvement," he said. Labor issues are also quite serious and fierce industrial competition in the market should not be neglected, experts noted. Chinese firms moving into the Chilean market will help break the monopoly formed by earlier market players, especially US and European counterparts, said Jiang, deputy manager of CHEC's Americas division. Liu, the associate research fellow with CAITEC, noted that domestic companies are expected to strictly comply with the local laws concerning labor, tax and visa management. Despite challenges, there are sound growth prospects for Chinese investors in Chile, according to experts. At the moment many goods and materials in the market come from China, and Chinese products will grab greater market share in the future, said Tai.